Today’s “In This Issue” table shows a double-header. 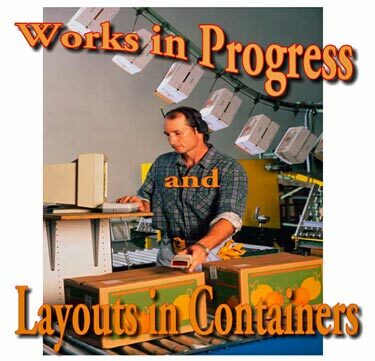 First comes a special report on layouts built in containers both commonplace and strange. Then, we’re including an unusual “second section” to our updates page, which appeared only two months ago! Here are some new developments on other layout ‘works in progress’ that have appeared here several times before. 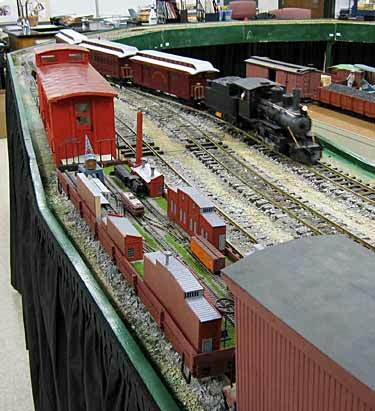 The Timesaver is shown at left running at a train show on the G-scale layout of the New Hampshire Garden Railway Society. A 7/8in figure (lower right photo) shows the scale reduction to represent a garden layout! For more information about Timesavers, see Adrian Wymann’s Shunting Puzzles website. If you’d like to try operating one yourself, check out Ken Olsen’s online switching puzzles (which also include a number of other good problems, mostly garnered from these pages). Once upon a time, Chris O’Donoghue, from near Rye, England, was given five pairs of socks in a very smart, heavy card box. As Chris tells it, “The socks are no longer in the box but it was too good to throw away. So, I devised a layout to utilise the box, along the lines of a shoebox railway. Well, not so much a layout, more a diorama to pose stock for photography. It would consist of a station building on a small platform with a single track in front and a short length of track in a bay to the left. “Then I thought, why not make it operational, albeit in a limited way? By adding a sliding traverser at each end and a hidden siding behind the backscene, stock could be moved from one end to the other—unseen—and even a limited amount of shunting could take place.” A mockup of the result is seen here: Soft Shoe Shuffle. The little layout can show off a lot of rolling stock, even with its limited operating scope. The moral: be very careful when you give a present to a model railroader… it may have unintended consequences! 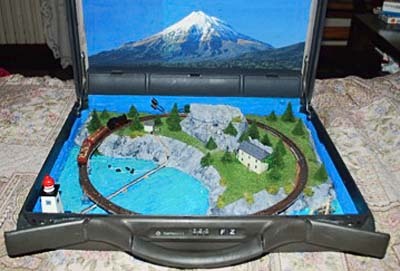 TRAIN IN BRIEFCASE, BRIEFCASE ON TRAIN, TRAIN EN ROUTE… PLEASURE! 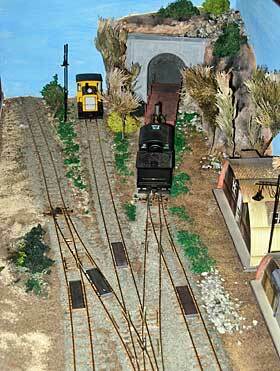 Francesco Zezza, who lives in Rome, Italy, was given a Märklin Z-scale starter set (battery operated). A long-time N scaler, he was puzzled at first… until he discovered an old Samsonite briefcase while cleaning up his computer room. Francesco continues, “Do I have to add anything? As a final note, Francesco advises that the 9V battery pack supplied with the set resulted in an “F1-like speed absolutely NOT prototypical, so after some experimenting I switched to two AA batteries (1.5V), and operations (or better yet, ‘train running’) looked immediately more and more natural.” Below: (left) Loco hits the mainland; (right) dolphins cavort by the cliff. We’ve been following the gradual development of Scott MacLean’s “window shelf” layout in Melbourne, Australia (see Scrapbooks #77 and #83a). Scott has finally declared that it’s as finished as it’s going to be, so here’s a “final” look at Hillside, a 45x16in (114x40cm) On30 layout. Wire-in-tube control of turnouts works fine for a layout like this one. Removing every other tie from the standard Peco 16mm track made a huge difference to its appearance, and I would strongly recommend it for an O scale narrow gauge setup like this. Card buildings are just great to make and use. 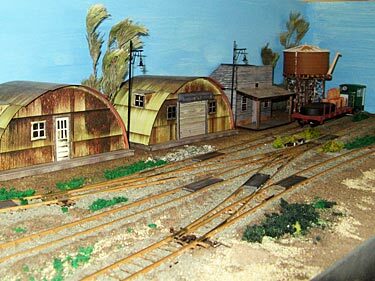 On the layout is one of the Clever Models Nissan huts [quonset huts], cut into two to give me double the bang. The three-way turnout, whilst expensive, makes the whole thing possible. A high standard of tracklaying is everything—without that, you are wasting your time. In retrospect, I should have taken even more care than I did. 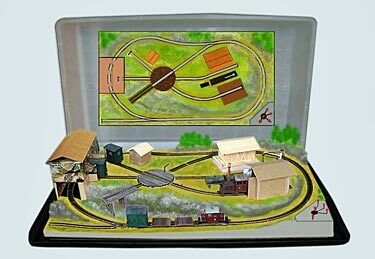 Scott offered a quick summary of his “operating system” for this little layout: “My current mode of operation is for the Forney to bring in a single car from the tunnel and park under the water tower. Then one of the Diesels takes the car and the puts it somewhere else on the layout. Then repeat. Then do it all backwards.” He might try a more elaborate system whenever this one stops being a lot of fun! BEAR POINT PASSES FOURTH BIRTHDAY, STILL IMPROVING! The layout visited its first train show this year, and one viewer made a video of it (click this link to see it). John summarizes, “After four years the Bear Point is still going strong and has a bright future. When I first built it, it was the smallest layout I had ever built. After building some smaller ones, I think it looks enormous! And in just four square feet, too.” John also made a video of his work; click the arrow below to view it. It was 2008 (Scrapbooks #72 and #73a) when we first encountered the Tortuga & Pine Creek RR of Brian Wilson, in Victoria, British Columbia, Canada. He was planning an On18 line measuring 32x18in (80x45cm) to be built in a Rubbermaid under-bed storage container. Feature of the line was a turntable built from a PVC drain cover. Well, most of those things are still the same, but quite a bit has changed! Brian comments, “I changed the plan to get a continuous run (my locos love me for it) and rearranged the sidings. 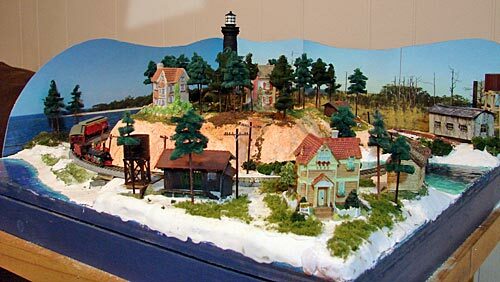 The layout is styrofoam covered with cork on a quarter-inch plywood base (for stiffening). There is an elevation change of 7 scale feet (1¾in/4.45cm) from the left front to the upper level.” The new plan is shown (above left) along with a heavily PhotoShopped picture of the layout mockup. The current state of construction (right) is more advanced, as Brian gradually adds landscaping and replaces the cardboard place-holder structures with completed buildings. We’ll try to keep you posted on continuing developments at this Work in Progress. It was only two months ago (Scrapbook #96a) that we published an update on Bichou’s Yard by Olivier Jeanneret, from Pully, Switzerland. But Olivier is a fast worker, and he already has made a significant new addition—a traverser fiddle yard for the layout. Here are some photos, and there’s much more information about the traverser at Olivier’s website. By popular request, here is an HO version of Prof Klyzlr’s Chicago Fork layout, featured in Scrapbook #97a. 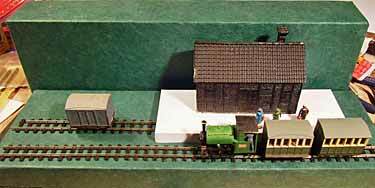 The original layout is O scale and measures 4x1ft, with a 4x1ft sector plate fiddle yard attached. This HO version—about as minimal as you can get and still have challenging operation—measures half that size, or 24x6in (60x15cm) with a similar-sized sector plate attached. Total real estate: 48x6in (two square feet). As space was limited in the original publication, here are some operational notes that were omitted from that article. The layout is a 3-2-2 Inglenook game. From the front, the tracks represent a Passing Siding and a Main Line which come together at the eastern end of a Burlington Northern runaround siding in Chicago. The third (rear) siding is an Industry Spur, serving an industry built in low relief on the backscene. The following is Prof Klyzlr’s concept for one way to operate this line in a prototypical fashion. 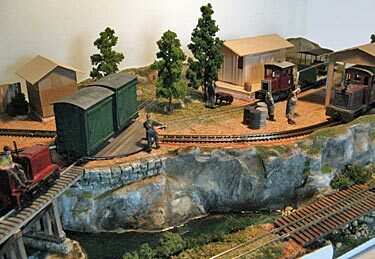 In the O-scale original he used a Geep diesel road switcher, two boxcars, a tank car and a flat car. Start the puzzle with a four-car train assembled on the Main Line (distinguished by the grey ballast), as if a “Local” has just rolled into town and has to work out which of the cars in its train need to be set out at the industry. This train will cross the entire baseboard and foul the switch, placing the locomotive on the sector table. Also the fact that the Main Line is one of the two-car spurs on a regular Inglenook should somewhat disturb the brain of even an experienced Inglenook Op. In any event, the logical first move is to split the four-car train across the two-car Main Line and Passing Loop tracks. Then cherry-pick the cars in the required sequence to spot at the three industry doors/car spots. Note that if the cars in the Local were not marshaled correctly out of the home classification yard, even this “simple” problem could get quite tricky. After the Local spots three cars at the industry, it “rolls on down the line” to deliver the fourth car to another industry down the branch (in other words, in the fiddle yard). The second cycle of operations will represent the Local crew heading back towards its home yard, picking up cars as it goes. Here the various interchange and exchange requirements on the way home will require the crew to assemble the departing cars in a specific order, on the two-car Main Line. (Yes, the last two cars assembled into the train will foul the turnout.) Then the Local “heads for home” (in our imaginations) with a full four-car train in tow. Of course, a few more difficulties could be placed in the crew’s path during either cycle. For instance, in the O scale version, one of the cars was a tank car. As a result, you could get really nasty and enforce the AAR rule—”cannot couple the tankcar directly to the loco for line-haul moves,”—which could tie up things quite handily. I’m sure your fertile mind can dream up other contingencies that require coping and also help make life on the tiny HO Chicago Fork an exciting and realistic railroading adventure. Track required to build the HO Chicago Fork. 1 – Atlas Custom Line #4 Left turnout; 4 – Atlas 36in flex track. DAWSON STATION CONTINUES TO EXPAND—NOW IT HAS LIGHT AND SOUND! 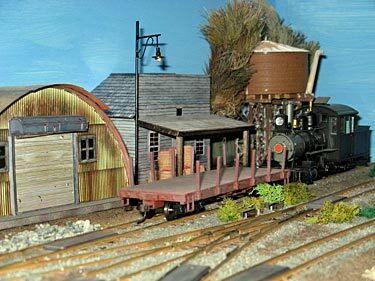 Ken Olsen, from Adair Village, Oregon USA, has continued to expand and improve Dawson Station, his award-winning 4x1ft (120x30cm) N-scale logging mill railroad. Ken has now added night lighting and sound effects, both shown to advantage in the video at right. For more info, see Ken’s blog. He has also expanded his programming skills and now provides online gaming of several classic switching problems, including Inglenooks, Timesavers and more. You can play for yourself at the blog’s Shunting Puzzles Page. Dawson Station previously appeared in Scrapbooks #88, #92, #96a, and #97a.